While the film is professionally made and “looks good,” what is missing from it is any organizing principle for its content. As a bio-doc, On Holy Ground is probably at its most successful. To simply tell the story of The Klezmatics, from the group’s founding in the Yiddish revival movement of the late 1980s in New York City through their 2007 Grammy award for Best Contemporary World Music Album for Wonder Wheel, followed by the collapse of the group’s label (Jewish Music Group [JMG]), and the possibility of the band’s breakup with founding member Frank London taking a teaching job, the movie is at its safest and most prosaic. The rise of The Klezmatics is properly contextualized in the Yiddishkeyt revival of the 1990s, with ethnic Jews (predominantly in North America) rediscovering their Jewish identity and recasting traditional Jewish values (specifically Jewish social consciousness) into cultural products. We are given solid ethnographic data on the importance of “klezmer” music (via The Klezmatics) as a conduit of those cultural values. Even non-Jewish members of the band, like the Quaker-raised Paul Morrissett, notes they were drawn to Jewish (Ashkenazi) traditional music because of the cultural values that music conveyed. The Klezmatics’ blend of traditional Ashkenazi music with contemporary jazz and rock-infusions has been keeping the band current for more than 20 years. Ethnomusicologist and music critic Bob Cohen notes at one point that The Klezmatics “are a power band. They’re not heavy metal, they’re heavy Yiddish.” The problem is that this particular story is about 15 years too late: when I was doing my doctoral research in the mid-1990s, the Yiddishkeyt revival was in full swing. If this story was told then, it would have been exciting and relevant. In 2010, it’s just yesterday’s kugel. In 2005, The Klezmatics released Brother Moses Smote the Water, a live album recorded with Joshua Nelson. Nelson’s presence, the film claims, symbolically connects The Klezmatics’ Ashkenazi roots music with the musical traditions descended from Ethiopian Jews; on a practical level, it adds African-American gospel music with Jewish themes to the group’s repertoire. The inclusion of Nelson’s music within the Klezmatics’ own style of contemporary klezmer demonstrates how this band is able to explore and push new musical boundaries. A fresher approach to the documentary would have been to explore, in more detail, these ethnomusicological fusions that The Klezmatics are known for. On Holy Ground also discusses the band’s 2006 project of recording some of Woody Guthrie’s Jewish influenced songs. Guthrie himself had Jewish blood through his maternal grandmother, Aliza Greenblatt, and he explored, but never recorded some of that musical legacy. The resulting album, Wonder Wheel, won the band its only Grammy award. Despite the award, the album’s distributor, Jewish Music Group (JMG), went bankrupt and the Los Angeles-based press at the time seemed completely uninterested in promoting the album. Again, there is a bigger story here that doesn’t get sufficiently developed. Between making Wonder Wheel and its win at the 2007 Grammy awards, The Klezmatics did an extensive tour of Poland, their first outside of Warsaw. The footage included in the film expresses the prejudices of the band in their first proper encounter with modern Poland; prejudices typical of North American Jewry’s first encounter with the landscape of the Holocaust. The Klezmatics play the White Stork synagogue in Wrocław and on the streets of Krakow. What they discover in playing Poland is that their Ashkenazi music isn’t received as the lost music of the Shoah/Holocaust, which is what they anticipated, but that modern Poles feel partially robbed of their own culture by the absence of a living Jewish presence in the country. But this story isn’t sufficiently developed within the film either. 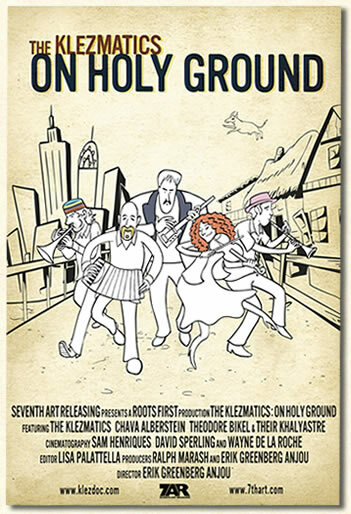 The Klezmatics: On Holy Ground, while interesting enough as a passive music documentary, touches on a number of significant topics; but because these aren’t developed, the film feels somewhat pointless. What was director Anjou’s purpose in making the film? Well, considering after watching it, I went onto iTunes and bought copies of Wonder Wheel and Brother Moses, the film works as a feature-length advertisement for selling the band’s albums. But not much more. Eatala: A Life in Klezmer is a very different kind of documentary, and one more in keeping with the idea of a“filmed ethnomusicological essay.” A “folklore film,” as Sharon Sherman defined it, is a film made by folklorists or about explicitly folklore topics. Eatala’s filmmakers, Barry Dornfeld and Debora Kodish, are folklorists making films for (primarily) folklorists. Whereas Anjou, a professionally trained filmmaker, has made a fairly bland, ticks-all-the-right-boxes kind of documentary, Dornfeld and Kodish are more interested in their film’s focus on family folklore. Eatala has at its centre the remarkable Elaine Hoffman Watts, a sixty-something klezmer percussionist who was trained by her grandfather Joey Hoffman and her father Jacob, and who broke new ground as the first female drummer in the Philadelphia klezmer scene. Just as her father trained her, Elaine has continued to train her own children, and now also trains her grandchildren, in keeping the klezmer tradition alive in Philadelphia. She still regularly performs with her daughter and others from the Philadelphia klezmer scene. While Eatala is a bio-doc, like aspects of On Holy Ground, the film is more than simply Elaine’s story despite its 37-minute running time. Ashkenazi traditional music is the focus of the Hoffman family, but the film is equally about how that family folklore is passed down through the generations; that is, while the film’s music is at the center, we are given insight into family histories, family traditions, family immigration stories, and so forth. In addition, the klezmer tradition in the Hoffman family is demonstrated as not entirely stable and conservative—each new generation adapts the music to the contemporary cultural context. At one point, Hoffman-Watts’ daughter Susan notes that their repertoire consists of two versions of the songs, one “trad” and, it is implied, the other more “modern.” We never discover what the other form of the song is—what the family members call it—but the implication is that it is a more contemporary variant on the “trad” number. In many of the sequences in the Hoffman home, the jamming musicians are cross-generational, as older members teach this musical tradition to the younger ones. Eatala is a lovely demonstration of that process of musical transmission. Eatala is a bio-doc, but as a folklore film it offers a much more nuanced and textured representation of cultural context than On Holy Ground. And as such, it is the more interesting film. Sharon Sherman, Documenting Ourselves: Film, Video and Culture (Lexington: University of Kentucky Press, 1998), p. 63.